Maddalena Fasciano first appears in Painesville Township, Lake County, Ohio, in 1913 when she married Painesville resident Giuseppe Cardegna. 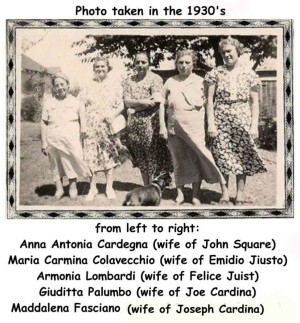 In America Maddalena Fasciano was known by her married name Lena Cardina. Maddalena Fasciano, daughter of Pietro Fasciano and Antonia Iammarino, was born on March 30, 1890, at Ripalimosani, Campobasso Province, Molise, Italy. She married Giuseppe Cardegna, son of Filippo Cardegna and Maria Giovanna Mainella, on July 5, 1913 at Cleveland, Cuyahoga County, Ohio. Giuseppe Cardegna was born at Frosolone, Isernia Province, Molise, Italy. Maddalena died on December 20, 1968, at her home, 821 North State Street, Painesville, Lake County, Ohio, at age 78. Her body was interred at St. Mary Cemetery at Painesville Township, Lake County, Ohio. Maddalena Fasciano immigrated to the United States on January 31, 1911, at age 20. She was travelling to Cleveland, Cuyahoga County, Ohio. Maddalena was joining her brother-in-law, Allesio Iammarino. She immigrated with her mother, Antonia Iammarino. They arrived in the United States at the Port of New York City. Maddalena Fasciano was enumerated for the 1920 Census of the United States, on January 9, 1920, living at Fairport-Nursery Road, Painesville Township, Lake County, Ohio, as a wife of Giuseppe Cardegna. Maddalena Fasciano was enumerated as Lena Cardeno. Maddalena Fasciano was enumerated for the 1930 Census of the United States, on April 15, 1930, living at Fairport Road, Painesville Township, Lake County, Ohio, as a wife of Giuseppe Cardegna. Maddalena Fasciano was enumerated as Lena Cardina. Maddalena Fasciano was widowed by the death of her husband, Giuseppe Cardegna, on July 6, 1937, at Cleveland, Cuyahoga County, Ohio. Maddalena Fasciano was enumerated for the 1940 Census of the United States, on April 4, 1940, living at State Route 535, Painesville Township, Lake County, Ohio, as a mother of Phillip Cardina. Maddalena Fasciano was enumerated as Lena Cardina.